A colour slide of an aerial view of Cochrane Street looking north in Whitby, Ontario. This view is of Cochrane Street south of Bonacord Avenue. 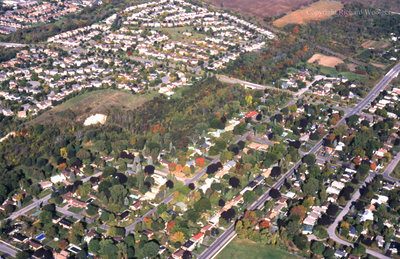 Aerial View of Cochrane Street looking North, October 7, 1998, Richard Woolger. Whitby Archives A2014_014_015.